The castle is open every day from 10.00 am to 07.00 pm all year long. The welcome desk and the gifts shop are open every day from 10.00 am to 07.00 pm. The shop offers a large choice of gifts and souvenirs ranking from postcards to figurines and knights’ costumes for children, as well as books and publications on the castle. You are guided through the castle by a written guided tour available at the entrance. This document enables you to discover the site at your own pace and gives you detailed information about the history, the architecture and today’s situation of the castle. The document exists in French, English, German, Dutch, Italian and Spanish. The whole site is open to the public as well as a permanent exhibit “Gratot, a life of eight centuries” displayed in four of the castle’s rooms, retracing its history. The artwork is displayed in the castle’s rooms. 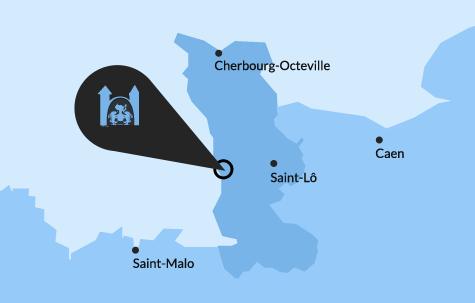 A leaflet published by the Department of Sites and Museums of the General Council of La Manche also set off to the discovery of the ermitage Saint-Gerbold, belonging formerly to the domain of Gratot and recently restored. The castle is only 4km away from Coutances and 80 km away from the Mont-Saint-Michel or the D-Day beaches. On the outskirts of Caen, take the A84/E401 road towards Saint Lo. Take the exit 40 and the N174 road all the way to Saint-Lô then the D972 road to Coutances. Follow the road circling the city and exit on the D44 in direction of Gratot. If you are coming from the D-Day beaches, you can also go to Saint-Lô anf follow the above itinerary. However, if you are close to Bayeux, it is shorter to take the N13/E46 road towards Cherbourg/Sainte Mère Eglise and exit at Saint Hilaire Petitville to take the D971 road all the way to Coutances and then take the D44 to go to Gratot. After Avranches, take the D973 towards Granville and then turn on the D 971 towards Coutances. When arriving to Coutances, take the D44 road to Gratot. Location of Castle Gratot in the Manche.